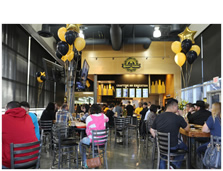 Innovation Brew Works is a café and brewery located on the Cal Poly Pomona campus at the Center for Training, Technology, and Incubation (CTTI) in Innovation Village. We are open to the public. Innovation Brew Works also serves as a learn-by-doing brewery laboratory for students. Echoing the learn-by-doing philosophy of Cal Poly Pomona and corresponding with the brewery's official tagline "Crafting an Education," students acquire hands-on experiences with brewing and brewpub operations. Students are exposed to applied propagation of custom yeast strains, the nitrogenation and carbonation process, and the development of unique hop and malt blends. Apparel, pint glasses, and refillable growlers are sold at Innovation Brew Works.